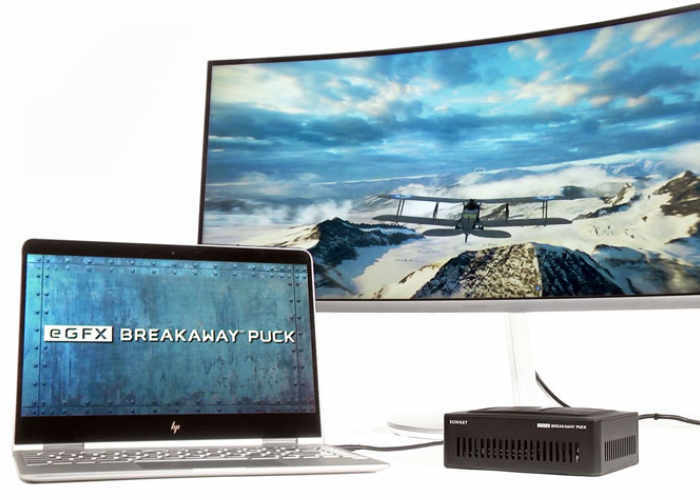 Gamers that would like to transform their ordinary laptop into a high-end mobile gaming PC may be interested in a new external GPU which has been created by Sonnet Technologies takes the form of the eGFX Breakaway Puck. Two different external GPU systems are available the eGFX Breakaway Puck Radeon RX 560 and eGFX Breakaway Puck Radeon RX 570 allowing users to choose depending on their budget and requirements. 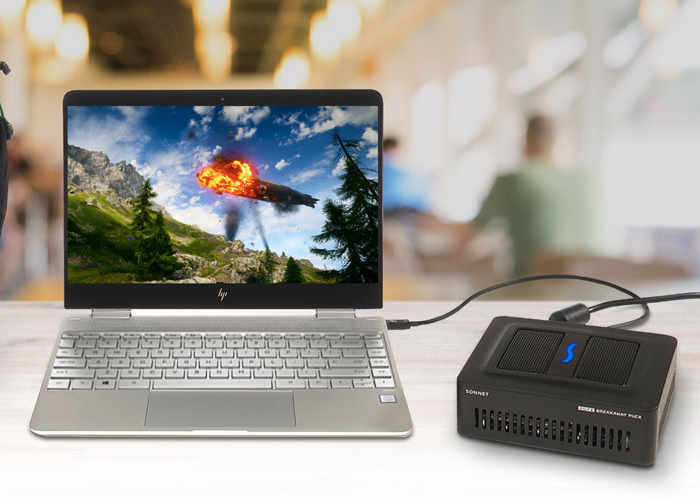 The small external GPU boxes measure just 6 x 5.1 x 2 inches tall and feature one Thunderbolt 3 port, three DisplayPort ports and one HDMI port supporting up to four 4K displays in multi-monitor mode. The eGFX Breakaway Puck Radeon RX 560 (part number GPU-RX560-TB3) a price that $449 USD; the eGFX Breakaway Puck Radeon RX 570 (part number GPU-RX570-TB3) priced at $599; and the optional PuckCuff VESA Mounting Bracket Kit (part number CUFF-PUCK) priced at $59. When GPU acceleration is needed on the road, users can conveniently pack an eGFX Breakaway Puck along with a notebook in a backpack or computer bag. The Puck connects to a computer with a single Thunderbolt 3 cable and, for added convenience, also provides 45W of Power Delivery to power and charge the computer, enabling many users to leave their computer’s power brick behind. On the desktop, the Puck has a minimal footprint. With an optional VESA mounting bracket kit, the Puck can be attached to the back of a display or the arm of a multimonitor stand, leaving a zero footprint on the desktop. The kit also includes a 0.5-meter DisplayPort cable to help reduce cable clutter.